Yes I Can? – Bring the Pain! 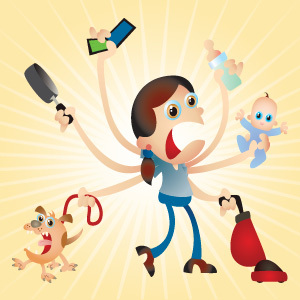 I suffer from SUPERMOM syndrome; a mental illness that fills my mind with delusions that I can be everything to everyone at all times, capable of managing everything that life brings my way without breaking a sweat. This grandeur informs me that I am just so incredible, so smart, so together that nothing can take me down, and when my family needs me, I pull out my VIP SUPERMOM member’s only card and go to work! I am the best of the best…in my mind. Ok, so what this really means is, I can do a few things at the same time. Like what? Well, I can do laundry, help with homework, brainstorm new product ideas for work and cook at the same time. I know, I know, hold your applause. This is just the tip of the iceberg. I garden, cook, lead Girl Scouts, workout to my Turbo Fire DVD, volunteer as team mom, cheer at sports games, go out on dates with my husband, keep my gray hair colored (mostly), travel for work, clean the house and e-file our taxes. Let me put it this way, I can leap tall buildings in a single bound while singing and doing the Harlem Shake. This is no easy feat. I work hard to keep my cool. Every now and then I have to slow down and take a break, but with all the demands of life, that time is fleeting. When the day ends I collapse in total exhaustion and wake the next morning to ride the SUPERMOM roller coaster again. To be fair and honest, I realize that I am not without faults or frailties. Oh yes! Believe me, being a SUPERMOM has its high highs and its low lows. The key is trying to stay in the middle. Maybe another term for this mental illness should be MANIC MOM or CIRCUS MASTER. I guess whatever hat fits best in the moment applies. So Thursday nights are my time to recharge. I put my SUPERMOM card away and relax. “What do you mean I don’t talk to you. I talk to you everyday,” I said. “No, I mean we don’t talk anymore, like we used to talk about stuff. We don’t read books at night. You don’t comb my hair and things like that,” she said. Before fully considering her comment, I looked at the clock to see how soon my show was going to start. TEN MINUTES. Yes. MANIC MOM was enraged. But what came from my mouth was much more compassionate. SUPERMOM knew what to do. You catch bees with honey, or something like that. “Mom, sometimes I just want us to BE together,” she said. My daughter sat there and didn’t move. She stared at me with big, brown, eleven-year-old eyes hopeful that her mommy would break down and give in. I was getting panicky. What should I do? “Wanna have breakfast on Saturday,” I asked. “It can just be you and me. We can go to the breakfast cafe on the corner.” I glanced over at the clock to check the time. FIVE MINUTES. I was caught. My daughter looked at me and rolled her eyes. “Can we talk now,” she asked in a whiny voice desperate for me to say yes. I took a deep, deep breath, closed my eyes and opened them. “Ok,” I said. I turned off the television and gave her a big hug. The guilt and shame overwhelmed me and I couldn’t stand myself. I pulled out my VIP SUPERMOM member’s only card and checked in. Oh, I can relate. Thanks for putting into words what really happens to Supermoms. This blog…….I love it!!!!!! I love it!!!! I LOVE IT!!! Please forgive me for taking this long to read your wonderful tales of life!!!! Yes I can is the story of my life:) Such a fantastic writer and as always I am in awe of your talents!!!!!! I am so happy that the world will now see your awesome talents too!! I just love it……with a big grin on my face!!! Previous Previous post: Where is My Coffee Mug? !